Treating symptoms of declined mental capacity (memory, mood, and behavior problems) in certain patients older than 60 years of age. Hydergine is an ergot alkaloid. Exactly how it works is unknown. 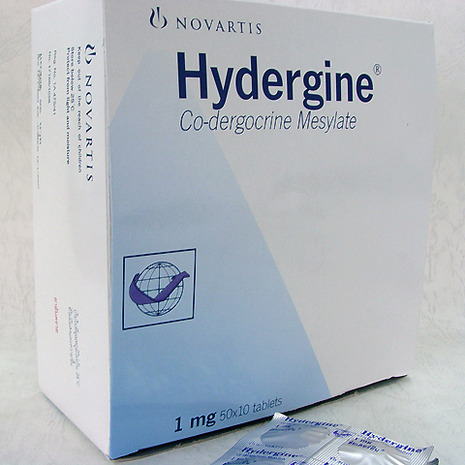 Hydergine is an ergoloid mesylate (derived from rye) and it has become one of the world's most useful and popular ‘smart drugs’. It is known to have all the following effects: increase blood supply to the brain, increase oxygen delivered to the brain, enhance metabolism of brain cells, protect the brain from insufficient oxygen supply, slow the deposit of the age pigment lipofuscin in the brain, prevent free radical damage to brain cells, and increase intelligence, memory, learning and recall. Hydergine has been touted for some time as a "smart" drug for use in enhancing mental abilities and improving intelligence. It has been around for more than 20 years and is marketed today as a nonspecific cerebral stimulant and prescribed to help relieve symptoms of age-related mental decline. Hydergine has been studied but found ineffective for the treatment of Alzheimer's disease. Hydergine® is a prescription oral medication used to improve symptoms and slow the onset of disorders that cause declining mental abilities. It is commonly prescribed for older patients with Alzheimer's disease or primary progressive dementia. When the drug is taken daily as directed by a physician, a patient can expect to notice improvements in memory and cognition. The risk of serious side effects and adverse drug interactions is low, but doctors still take care when prescribing Hydergine® to patients who have high blood pressure or heart disease to prevent potentially serious complications.